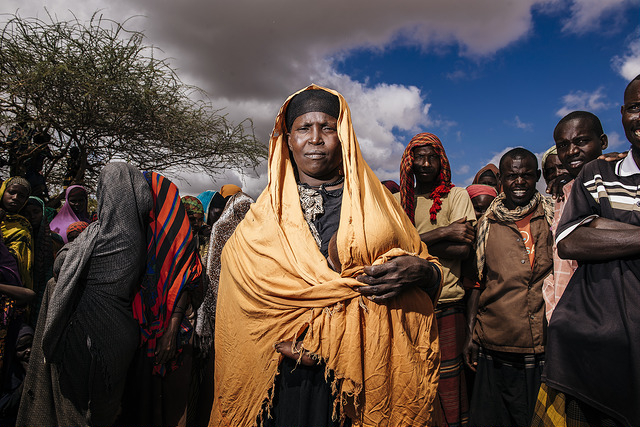 Somalia is facing a worsening humanitarian crisis with 6.7 million people in need of urgent assistance as severe drought sweeps across East Africa. Caritas is able to save lives but funding means not enough can be done to prevent the food crisis from deepening . The epicentre of the food crisis is around south-central Somalia and the capital Mogadishu, where thousands of people are seeking survival in makeshift camps with unsanitary conditions. In the Shanties Dhuyuleh Internally Displaced Persons Camp, Caritas member Trócaire gives food ration cards. Somalia has been struck by severe drought due to two consecutive seasons of poor rainfall. Areas such as central and southern Somalia have registered only a third of their usual seasonal rainfall this year. Community Health Workers at Akara Cholera Treatment Centre try to find a vein in baby Rahma’s hand in order to administer an IV drip. 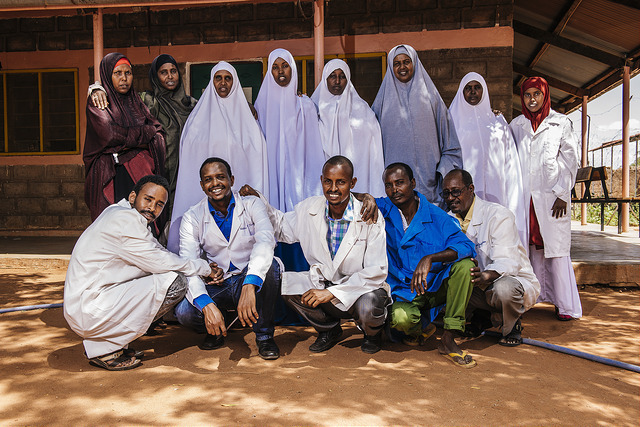 They are tackling a cholera outbreak in Gedo – with emergency medical assistance, treatment of affected water supplies to stop the spread of the disease, and supplying clean water to 15 schools and three hospitals in the region. Among the worst-affected areas is Gedo in the south-central region of the country. Healy said most agricultural communities have lost their livestock and crops. The drought is forcing thousands of people to leave their homes while humanitarian access is limited in some areas due to insecurity. “The outlook is bleaker than it was in 2001-2004 when we had the last food crisis,” he said. Healy and his team are seeing growing numbers of children and lactating mothers with severe or acute malnutrition. A cross section of the staff of Khalil District Hospital. Caritas organisation Trócaire has a strong, long-established presence in the Gedo region in southern Somalia. There, they currently fund and run three hospitals, 10 primary health units and four health centres. Drought-related diseases, such as cholera, have also been creating huge challenges particularly when families are uprooted.“In the month of May our centre treated over 19,000 people for cholera and malnutrition,” Healy said. “We have treated 5,000 cases of cholera in the past two months. Caritas and its Irish member Trócaire have been working together to address health and nutrition by providing nutritional supplements, responding to the cholera outbreak and also providing hygiene promotion and cash payments for families. Healy says the crisis is seriously underfunded and donations are urgently needed despite the generous response from Caritas organisations in Australia, Canada, Europe and South-East Asia. 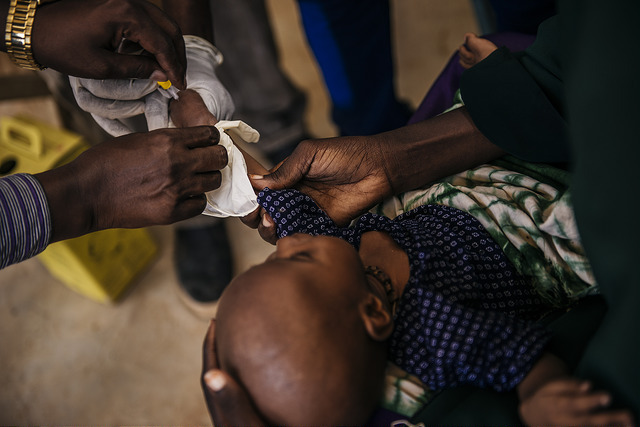 Caritas monitors and cares for malnutrition through it’s health centres, for example at the Dollow Cholera Health Centre. 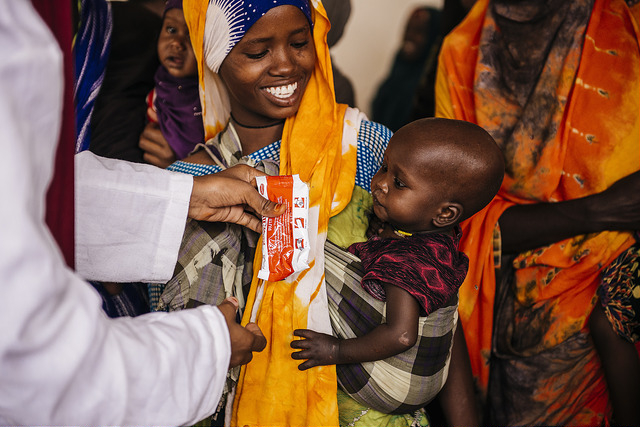 Adeego Adan Hussein is assisted by hospital staff in feeding her daughter, Deeqa Ibrahim, with Plumpy Supplement. During the 2011 famine, 260,000 people died in Somalia. There are fears that history will repeat itself. Caritas is focusing on simply saving lives of starving children and mothers with the money it has, but severe underfunding means that plans it has to prevent famine from spreading are on hold. Caritas currently funds 140 aid projects, providing assistance for more than 4.3 million people in need in East Africa. Around two thirds of Caritas programmes focus on food security and livelihoods.